This article describes anatomical terminology that is used to describe the central and peripheral nervous systems - including the brain, brainstem, spinal cord, and nerves. Neuroanatomy, like other aspects of anatomy, uses specific terminology to describe anatomical structures. This terminology helps ensure that a structure is described accurately, with minimal ambiguity. Terms also help ensure that structures are described consistently, depending on their structure or function. Terms are often derived from Latin and Greek, and like other areas of anatomy are generally standardised based on internationally accepted lexicons such as Terminologia Anatomica. To help with consistency, humans and other species are assumed when described to be in standard anatomical position, with the body standing erect and facing observer, arms at sides, palms forward. Anatomical terms of location depend on the location and species that is being described. To understand the terms used for anatomical localisation, consider an animal with a straight CNS, such as a fish or lizard. In such animals the terms "rostral", "caudal", "ventral" and "dorsal" mean respectively towards the rostrum, towards the tail, towards the belly and towards the back. For a full discussion of those terms, see anatomical terms of location. For many purposes of anatomical description, positions and directions are relative to the standard anatomical planes and axes. Such reference to the anatomical planes and axes is called the stereotactic approach. Standard terms used throughout anatomy include anterior / posterior for the front and back of a structure, superior / inferior for above and below, medial / lateral for structures close to and away from the midline respectively, and proximal / distal for structures close to and far away from a set point. Rostral and caudal: In animals with linear nervous systems, the term rostral (from the Latin rostrum, meaning "beak") is synonymous with anterior and the term caudal (from the Latin cauda, meaning "tail") is synonymous with posterior. Due to humans having an upright posture, however, their nervous system is considered to bend about 90°. This is considered to occur at the junction of the midbrain and diencephalon (the midbrain-diencephalic junction). Thus, the terminology changes at either side of the midbrain-diencephalic junction. Superior to the junction, the terminology is the same as in animals with linear nervous systems; rostral is synonymous with anterior and caudal is synonymous with posterior. Inferior to the midbrain-diencephalic junction the term rostral is synonymous with superior and caudal is synonymous with inferior. Dorsal and ventral: In animals with linear nervous systems, the term dorsal (from the Latin dorsum, meaning "back") is synonymous with superior and the term ventral (from the Latin venter, meaning "belly") is synonymous with inferior. In humans, however the terminology differs on either side of the midbrain-diencephalic junction. Superior to the junction, the terminology is the same as in animals with linear nervous systems; dorsal is synonymous with superior and ventral is synonymous with inferior. However, inferior to the midbrain-diencephalic junction the term dorsal is synonymous with posterior and ventral is synonymous with anterior. Contralateral and ipsilateral referring to a corresponding position on the opposite left or right side (the sagittal plane) and on the same side (ipsilateral) respectively. 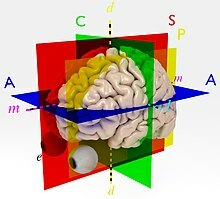 The anatomical axes of orientation of the human brain are at odds with the anatomical axes of the human body in the standard anatomical position. P: A Parasagittal plane (yellow) through one eye; parasagittal planes comprise the class of planes parallel to (and therefore lateral to) the sagittal plane. Standard anatomical planes and anatomical axes are used to describe structures in animals. In humans and most other primates the axis of the central nervous system is not straight, but bent. This means that there are certain major differences that reflect the distortion of the brains of the Hominidae. For example, to describe the human brain, "rostral" still means "towards the face", or at any rate, the interior of the cranial cavity just behind the face. However, in the brain "caudal" means not "towards the tail", but "towards the back of the cranial cavity". Alternative terms for this rostro-caudal axis of the brain include medial or antero-posterior axis. "Dorsal" means "in the direction away from the spinal cord i.e. in the direction of the roof of the cranial cavity". "Ventral" means downwards towards floor of the cranial cavity and thence to the body. They lie on the superior-inferior or Dorsoventral axis. The third axis passes through the ears, and is called the left-right, or lateral axis. Axial, the plane that is horizontal and parallel to the axial plane of the body in the standard anatomical position. It contains (and thus is defined by) the lateral and the medial axes of the brain. Coronal, a vertical plane that passes through both ears, and contains the lateral and dorsoventral axes. 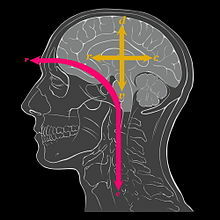 Sagittal, a vertical plane that passes from between the nostrils, and between the cerebral hemispheres, dividing the brain into left and right halves. It contains the dorsoventral and medial axes of the brain. A parasagittal plane is any plane parallel to the sagittal plane. Specific terms are used for peripheral nerves that originate from, or arrive at, a specific point. An afferent nerve fiber is a fibre originating at the present point. For example, a striatal afferent is an afferent originating at the striatum. An efferent nerve fiber is one that arrives at the present point. For example, a cortical efferent is a fibre coming from elsewhere, and arriving to the cortex. Note that that is the opposite of the direction in which the nerve fibre conducts signals. A chiasm (from Greek, meaning 'a crossing') is used to describe an X-shaped crossing of nerve fibres between the cerebral hemispheres. The major example in the human brain is the Optic chiasm. The main difference between such a chiasm and a decussation is that not all nerve fibres entering the chiasm cross over. A commissure is a group of nerve fibres crossing the sagittal plane mainly parallel to the lateral axis and therefore without forming a cross-shape. For example, nerve fibre tracts that cross between the two cerebral hemispheres, are the anterior commissure, posterior commissure, corpus callosum, hippocampal commissure, and habenular commissure. The spinal cord contains a commissure as well: the anterior white commissure. A decussation is where nerve fibers cross from one side of the brain to the other. Image of the human brain showing sulci, gyri, and fundi shown in a Coronal section. A deep groove produced by opercularisation. An example is the Sylvian Fissure. A deep groove produced by the differentiation of the telencephalic vesicles. An example is the Medial longitudinal fissure, also known as the interhemispheric fissure. Look up fundus in Wiktionary, the free dictionary. ^ a b Hal., Blumenfeld, (2010). Neuroanatomy through clinical cases (2nd ed.). Sunderland, Mass. : Sinauer Associates. ISBN 9780878930586. OCLC 473478856. This page was last edited on 5 October 2018, at 04:30 (UTC).